Cleaning out “rust” from the brain could be a way to slow and even prevent Alzheimer’s, say researchers. The finding pinpoints iron as a potential driver of the degenerative disease. Previous research has long linked Alzheimer’s to a build-up in amyloid protein fragments in the brain that are normally broken down in healthy brains. But efforts to treat Alzheimer’s by using drugs that reduce amyloid levels have so far failed, leading to speculation that something else is driving the disease. New research, published in the journal Brain, suggests iron might be the culprit. Iron has a special property that allows it to exchange electrons, which is crucial in allowing our bodies to generate energy from oxygen and fuels such as sugars. But it can also damage neurons in the same way that iron metal rusts in the presence of oxygen. The researchers used magnetic resonance imaging techniques to measure iron levels in the brain. They found that people with high levels of iron in combination with high levels of amyloid were suffering rapid cognitive decline, but that people with high levels of amyloid but low levels of iron in the brain, were stable. They are now going to carry out a five-year trial to test whether an anti-iron drug can slow the progress of Alzheimer’s, which would be a major breakthrough in finding a treatment. “Given the data from our study, it seems reasonable to hypothesize that lowering iron in the brain would slow the progression of the disease, but we can only know that by testing it, which is what we are now going to do,” says lead researcher Scott Ayton, who is based at the Florey Institute of Neuroscience and the University of Melbourne. Ayton cautions that the amount of iron in a person’s brain appears unrelated to their iron intake or iron levels in the blood. People therefore shouldn’t be cutting down on iron in response to these results. It also means that levels of iron in the blood aren’t an indicator of Alzheimer’s risk. “We don’t have any evidence that the amount of iron you eat, or the amount that is measured in your blood, has any impact on the amount of iron in your brain, so we are not recommending people change what they eat based on our research,” Ayton says. Indeed iron is important in generating energy, but Ayton says it is also a double-edged sword as it can cause cell death, including the death of neuron cells in the brain. While iron and oxygen combine in the body to produce energy, the by-product is oxidative stress, which is similar to rust that deteriorates metal. “The rusting you see on iron metal is the same rusting reaction that occurs in the brain,” Ayton says. The hunt for an alternative driver of Alzheimer’s gained momentum when the same Florey Institute research group published a study in 2013 that found that among a group of participants aged over 70 with high levels of amyloid, about 30 percent had no symptoms of dementia such as memory loss and falling cognitive function. 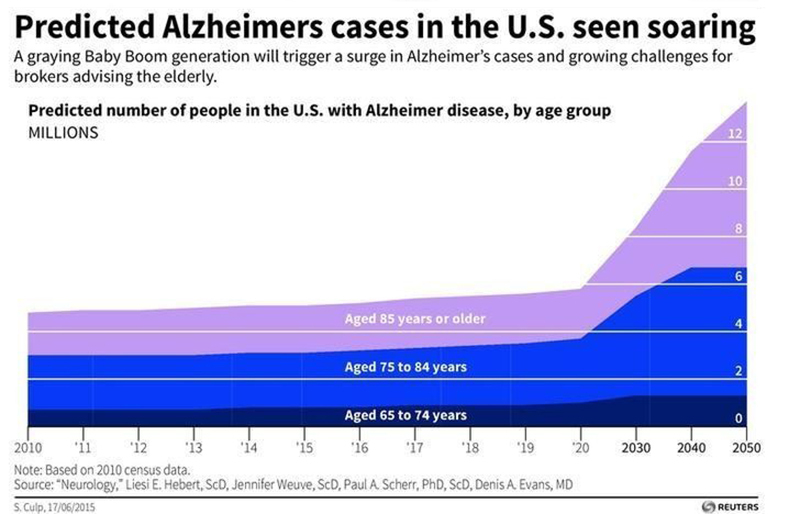 Alzheimer’s disease is the leading cause of dementia. “Amyloid build up is clearly important in Alzheimer’s. If you have high levels of amyloid in the brain then you are likely to get Alzheimer’s, but we just don’t know when. That’s why we hypothesize that another type of lesion in the brain is required for an individual to move from having the underlying pathology of the disease, i.e. amyloid build up, to the degenerative state of dementia,” explains Ayton. The research team was further encouraged to target iron after they found that high levels in brain fluid were correlated with symptoms of dementia. They recruited 117 participants of whom 56 had elevated levels of amyloid as measured by PET scans (positron emission tomography). MRI techniques were then used to measure iron levels. Over a period of six years they tracked these people’s cognitive function. They found that elevated iron in combination with elevated amyloid was strongly correlated with rapid cognitive decline. The decline was further correlated with the location of the iron build up in the brain. A high level of iron in the hippocampus, which stores short-term memory, was correlated with memory decline. Similarly, high levels of iron in the temporal and frontal lobes, associated with language, were correlated with poor performance in language tasks. Could an anti-iron drug work? The researchers now plan to test anti-iron drug Deferiprone on a cohort of Alzheimer’s patients. Deferiprone is known to reach the brain and there is early clinical evidence that it is effective in slowing Parkinson’s, a neurological disease that leads to movement disorders and is also associated with brain iron. “These results for Deferiprone in Parkinson’s are what have really encouraged us to test the same drug on Alzheimer’s,” says Ayton. Professor Ashley Bush, senior researcher on the study, says that if reducing brain iron is shown to be effective it could lead to a routine treatment for Alzheimer’s. 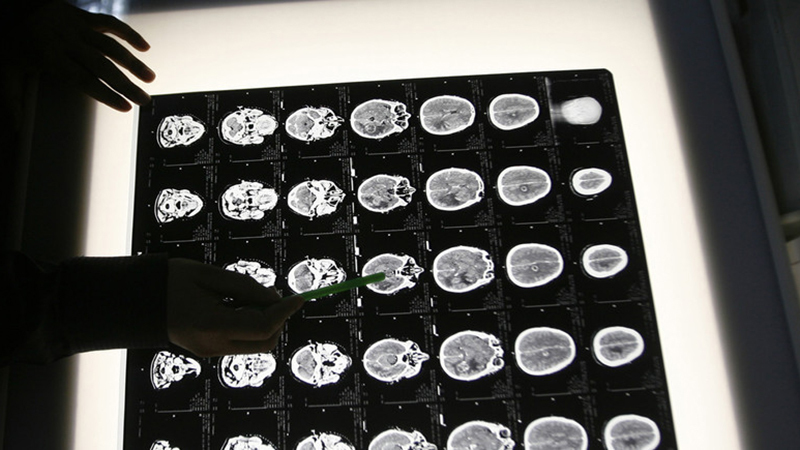 “If the trial results prove that low brain iron slows disease progression, we imagine a future where your GP sends you off for your 60-year health check, including a brain iron MRI scan, which is quick, cheap and painless,” says Bush. “If you have high brain iron, then we would order an amyloid PET scan.